If you’re not sure where to begin, use the Search box in the banner at the top of any page. Enter a person’s name, a vessel name, or any other words of interest and click the ‘magnifying glass’ icon. 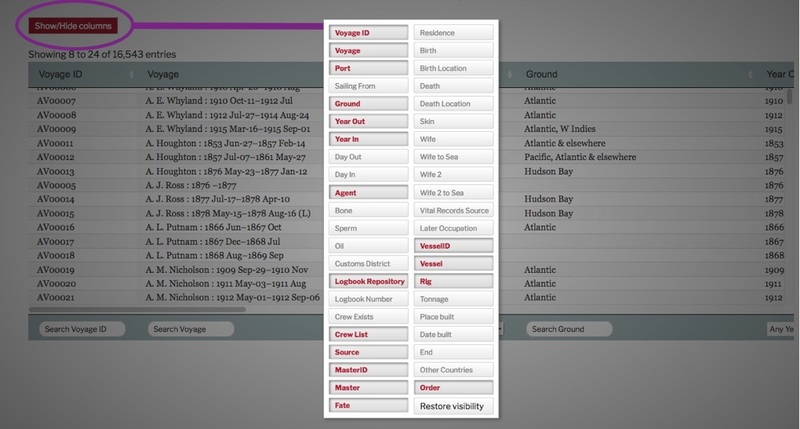 This site Search function knows about all of the databases and all of the web pages on the Whaling History website. It will return any results it finds from each one in a separate tab. WhalingHistory.org is a repository for data about whaling. For a general overview of whaling and whaling history, here are some resources to start your exploration. Each of them takes a different approach: a narrative, a collection of artifacts and maps, a timeline, a collection of topics, a map, a work of literature. 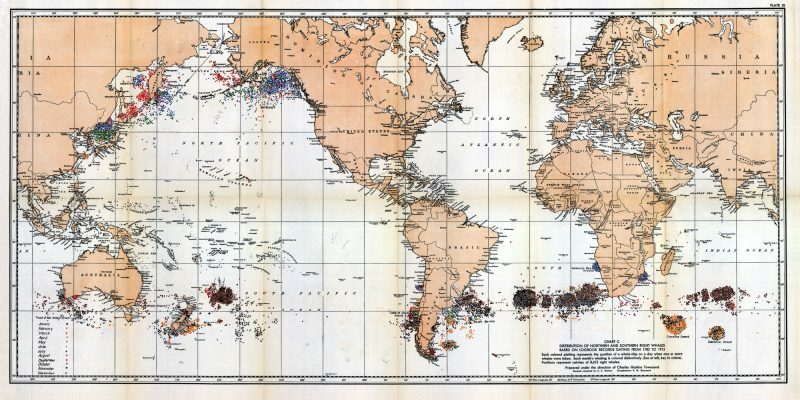 WhalingHistory.org has been greatly expanded in the past year to include whaling data from more countries, links to scanned documents online, and a new global search. British North American (BNA). 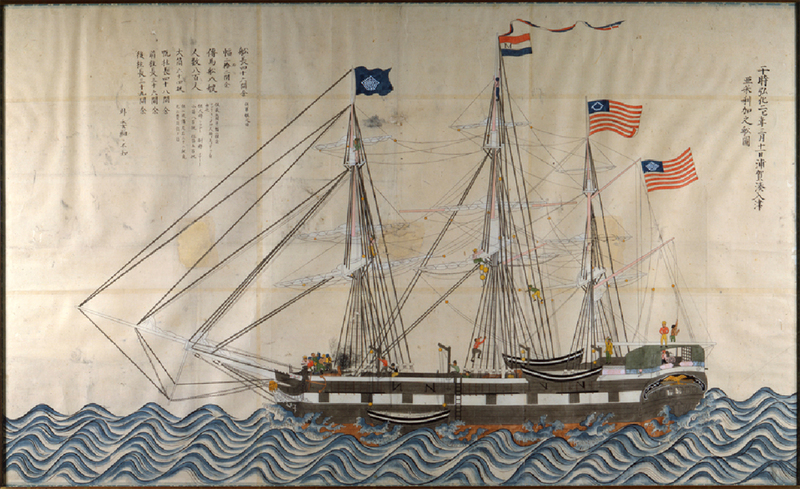 A database of whaling voyage data has been added. 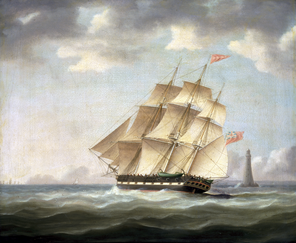 This includes information on 170 masters, 84 vessels and almost 300 whaling voyages from the east coast of British North America from 1779 through 1845 The details of these voyages are largely the work of Andrea Kirkpatrick, compiled for her forthcoming book on this fishery. Les Baleiniers Français (LBF). Almost 1,000 records for French whaling voyages come primarily from digitization of Thierry DuPasquier’s tables from his two books documenting that country’s whaling trade. The data was confirmed and augmented by the generous contributions of Peter Tremewan who shared his translations of French maritime documents from the Archives Nationales, in Paris. American Offshore Whaling Voyages (AOWV). The data already on WhalingHistory.org has been edited and augmented with new biographical information about whaling masters and their wives. And, crew lists for another 350 voyages have been added by a volunteer project at New Bedford Whaling Museum. British Southern Whale Fishery (BSWF). 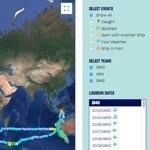 The voyage and crew list databases have been extensively revised and updated. Global Search. A new search page makes it possible to search all of the databases on WhalingHistory.org at the same time. Now that we have five major data collections, each with multiple datasets, global search is the most powerful way to start your exploration of Whaling History. Search for a name to find every occurrence—as a whaling master, crew member, owner, agent, master’s wife, vessel, … —in any database on the site. Advanced Search. Each database has a data viewer—a tabular display window to interact with the data—for precision searching and access to every data field available. Researchers can search, sort, and select subsets of the data for printing, copying to spreadsheets or other documents, and downloading. 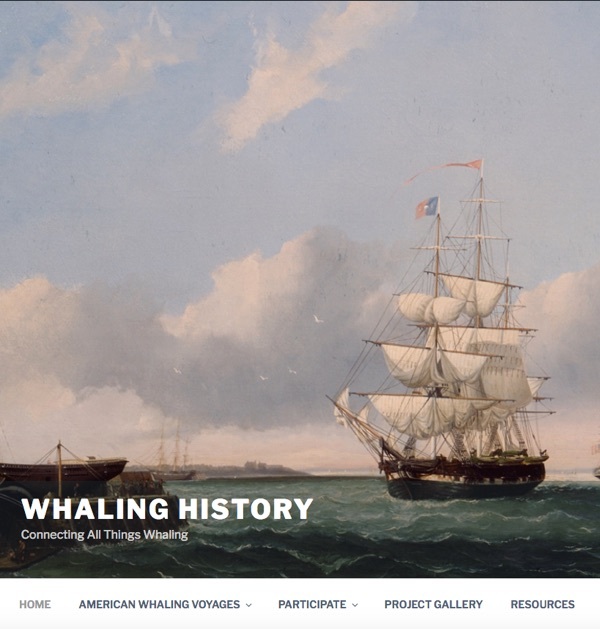 We have added an Explore menu to offer new ways to dig into the Whaling History databases and to feature aspects of the data that might not otherwise be discovered. One of the first Explore topics is Women who went whaling, an opportunity to find voyages on which the master’s wife sailed. This voyage of Neptune is American Offshore Whaling Voyage AV10372. 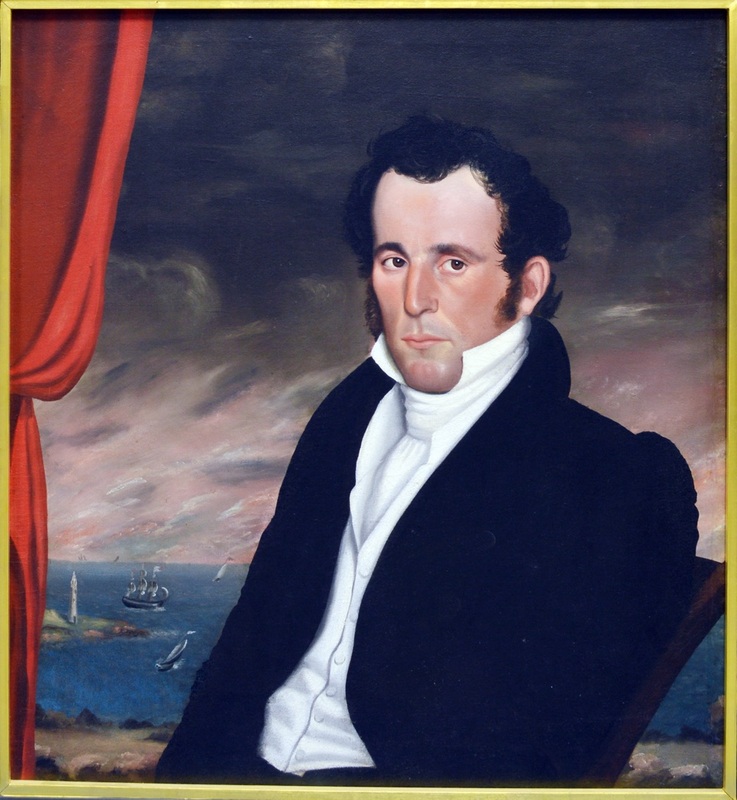 Our database includes summary information about the voyage, the vessel and the master, Samuel Greene, Jr., as well as a crew list. 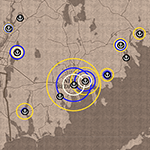 In building her interactive voyage map, Allyse Zajac started with AOWL logbook data then added detail, encoded special events, and transcribed all of the complete logbook entries from the original logbook in the collections of Mystic Seaport Museum. In the next phase of our project, we hope to take the data set from her project and use it to enhance the information on whalinghistory.org. At its peak in the mid-19th century, whaling was a gigantic, global business that provided oil to light the streets and homes of Europe and America, and bone to make profitable consumer goods for sale around the world. The young United States dominated this industry, and for a time, whaling was the fifth largest sector of the American economy. 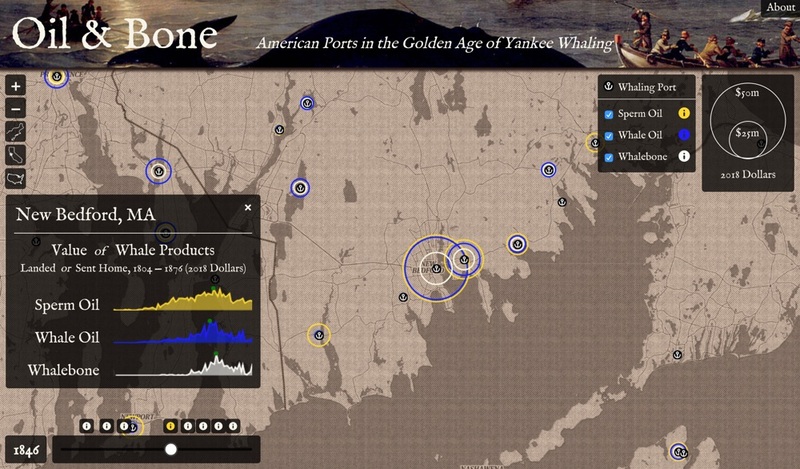 While stories of whaling drama, adventure, and violence are typically set at sea, this map aims to communicate the economic impact of whaling back in American ports, where sperm oil, whale oil, and whalebone landed and entered the market. 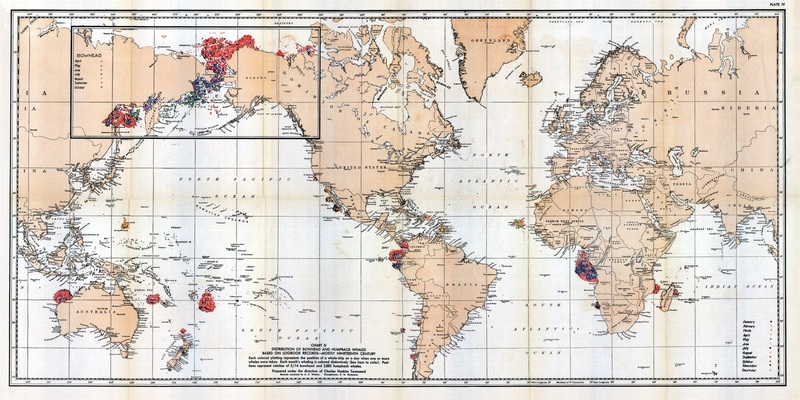 For over 60 port cities and towns, this map reports the market values of whale products as they were returned to port from 1804 to 1876, illustrating the drastic ebbs and flows of the industry. WhalingHistory.org is now hosting two important data sets documenting British whaling. The databases contain voyage and crew information for the British Southern Whale Fishery, which operated from 1775 to 1859. 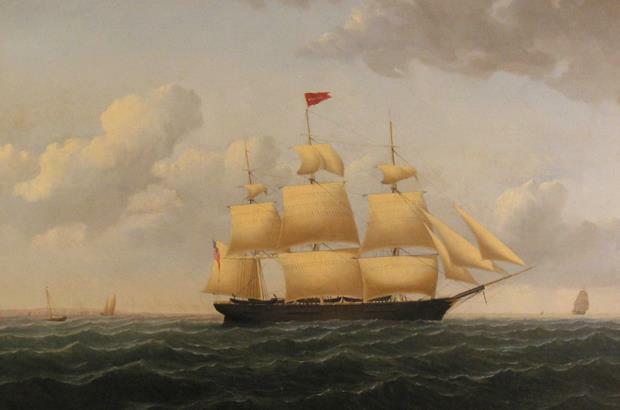 The voyage database, which is primarily the work of A G E (Joe) Jones, documents the events of about 2550 voyages, whaling or sealing, to the south of Britain in over 930 different vessels. The crew database, which is primarily the work of Dale Chatwin, lists nearly 14,000 entries for men who sailed in the ships in the British Southern Whale Fishery. For 350 years until the early 1960s the British were involved in several types of whaling. This involvement was divided into three distinct trades: the northern whale fishery between 1610 and 1914; the southern whale fishery or ‘south seas trade’ from 1775 to 1859; and the modern whaling trade, from 1904 to 1963. 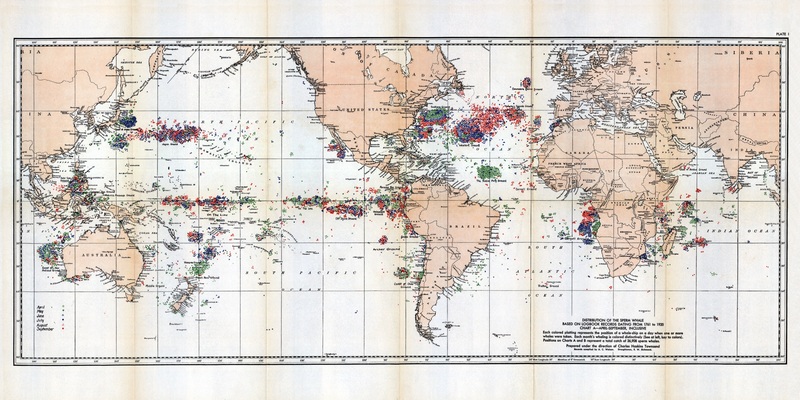 Each of these trades was distinguished by the geographical location in which it was undertaken, the types of whales pursued, and to some extent by the methods and techniques used to capture whales. The northern and southern whale fisheries were even differentiated and defined by law. 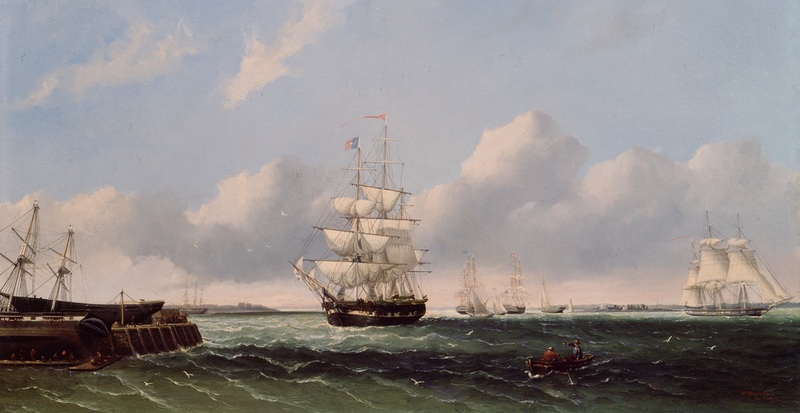 We are especially pleased to host the BSWF data because many American whalers also sailed from British ports in the years after the American Revolution. We are looking forward to making these connections explicit, linking records in the American Offshore Whaling databases with those in the British Southern Whale Fishery data. Smith TD, Reeves RR, Josephson EA, Lund JN (2012) Spatial and Seasonal Distribution of American Whaling and Whales in the Age of Sail. PLoS ONE 7(4): e34905. American whalemen sailed out of ports on the east coast of the United States and in California from the 18th to early 20th centuries, searching for whales throughout the world’s oceans. From an initial focus on sperm whales (Physeter macrocephalus) and right whales (Eubalaena spp. ), the array of targeted whales expanded to include bowhead whales (Balaena mysticetus), humpback whales (Megaptera novaeangliae), and gray whales (Eschrichtius robustus). Extensive records of American whaling in the form of daily entries in whaling voyage logbooks contain a great deal of information about where and when the whalemen found whales. 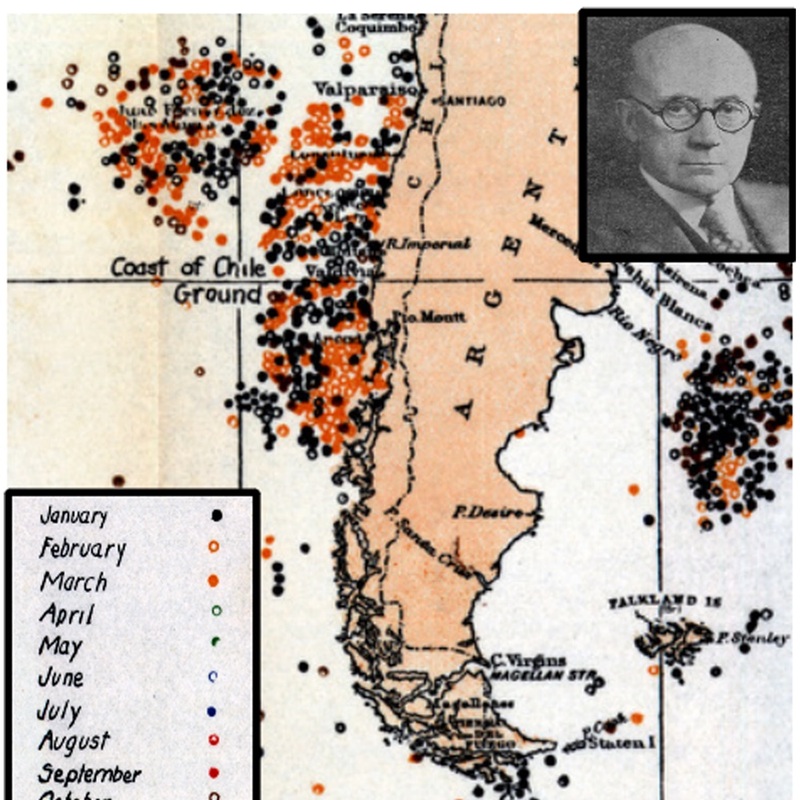 We plotted daily locations where the several species of whales were observed, both those caught and those sighted but not caught, on world maps to illustrate the spatial and temporal distribution of both American whaling activity and the whales. 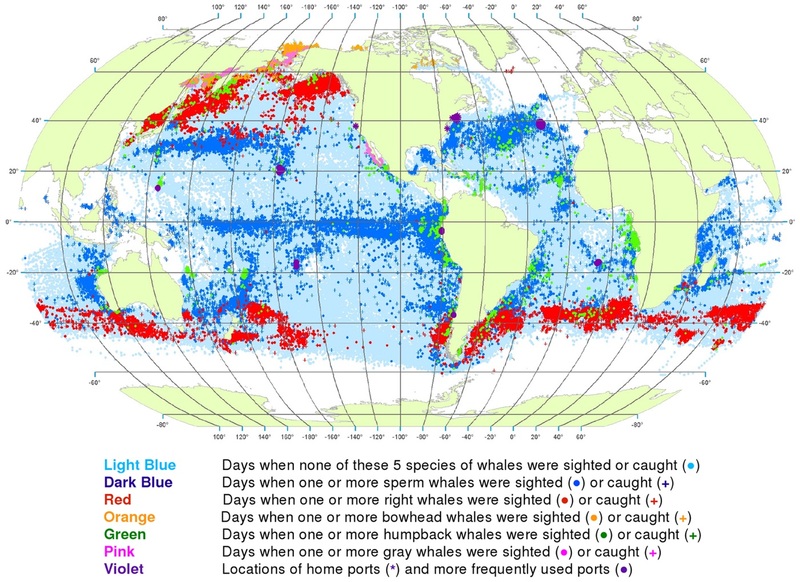 The patterns shown on the maps provide the basis for various inferences concerning the historical distribution of the target whales prior to and during this episode of global whaling. Chart C: Distribution of northern and southern right whales based on logbook records dating from 1785 to 1913. Chart D: Distribution of bowhead and humpback whales based on logbook records – mostly Nineteenth Century. 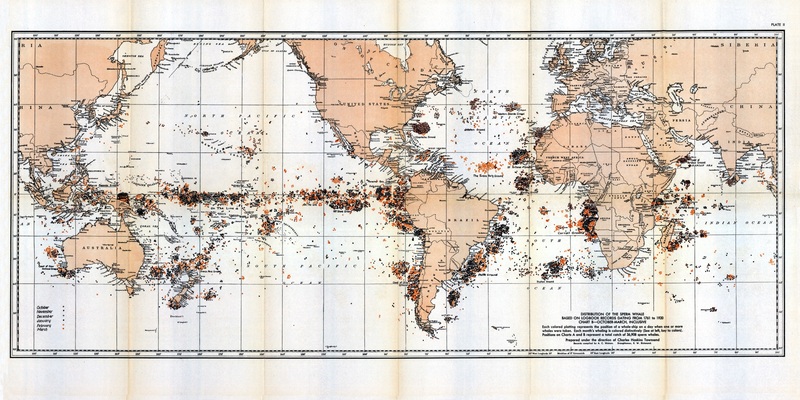 From Townsend CH (1935) The distribution of certain whales as shown by logbook records of American whaleships. 19. Zoologica (NY): : 1–50+6 Charts. The data viewers are available from the Databases item on the main menu at the top of every page. The view displays a scroll bar on the bottom to scroll left-and-right through the available columns. A scroll bar on the right edge scrolls through the records. In the top left, the viewer shows the records currently in the display window. If you have a tablet or other touch screen device, you can also swipe vertically or horizontally to scroll the data. Click on any column heading to sort the database by that column. The triangle to the right of that column name will turn blue to indicate that the column is sorted. Click again on the column heading to reverse the sort order. (The blue triangle will invert.) To add more columns to your sort, alt-click or option-click on their column headings. At the top or bottom of each column is a search box. Some columns have a selection menu that will pop up, others have a free form text box. Text searches are not case sensitive. 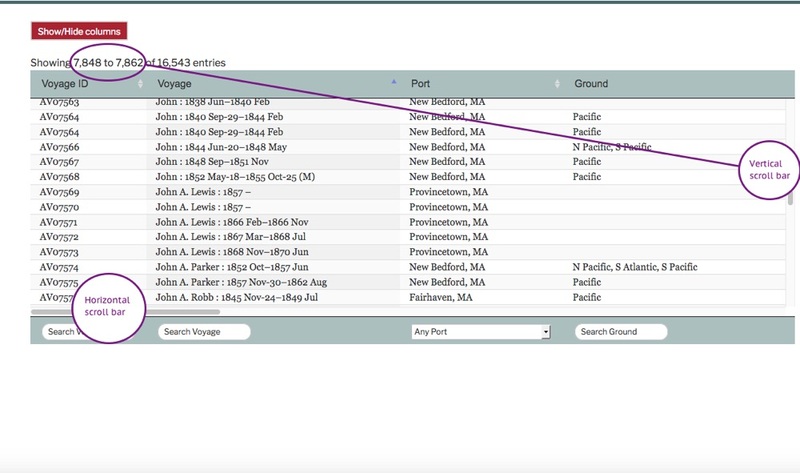 Multiple search words are treated as if joined with AND, so choosing “Fall River, MA” with the Port menu and typing “indian” in the Ground search box will result in all voyage records that have Port=”Fall River, MA” AND Ground contains “indian”. Some of the databases are very large—please be patient, your search results may not appear instantaneously. To clear all active searches, use the red “Clear all searches” button in the top right. In the Voyages database, click on a single row in the data viewer for a full display of all aspects of the voyage at the bottom of the page. To select more than one row, click on the first row, then add more with shift-click. Depending on your browser and operating system, you may also be able to add individual records using ctrl-click or ⌘-click. Or, after searching the database you can select the found records by clicking the “Select all search results” button that will appear in the top right. To unselect all selected records, click the red “Clear selection” button. Printing, copying and export all work with a selection, which may include one or more records. For the examples below we’ve selected all the voyages of the bark Sappho. 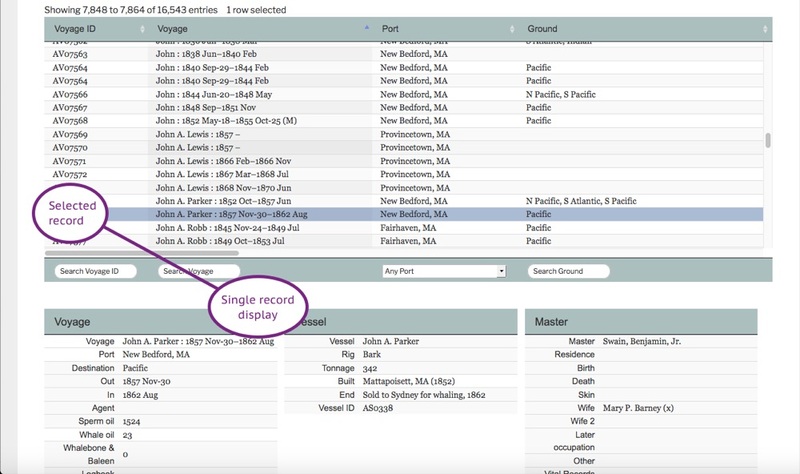 This selection happens to fit neatly in our data viewer window, but your selection might include many more records than you can view at one time. The set of columns that you’ve chosen with the “Show/Hide” button will be the columns that appear in your print, copy or export. 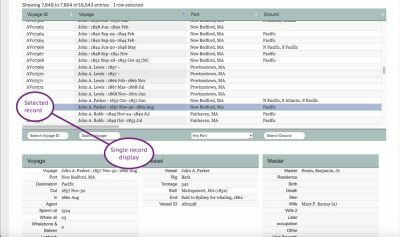 To produce a printable version of the selected records, click on the “Print selected” button in the top left. A new browser window will open with your data in a table. You can then print the page using your browsers print command. Depending on your operating system, you may also be able to save the output as a PDF file, or email or text it to yourself and others. To copy the selected records to your clipboard, click on the “Copy selected” button. A message will appear to tell you that the data has been copied. You can then paste the data into any other application. It is properly formatted so that you can paste directly into a spreadsheet. It will also format neatly in a word processor. If pasted into a plain text editor, the result will be tab-delimited text. To export your selection as a CSV file, click on the “Export selected” button. Your computer operating system will prompt you to save the data. The resulting file will be comma-delimited and all columns will be wrapped with quotation marks. The first row will contain the column names. A file in this format can be opened in a spreadsheet, or it may be imported into software for managing databases or performing statistical analysis.